Is there value in dreaming up buildings that can never be built? A few weeks ago, I read an article on some site or another about Lebbeus Woods, the visionary architect who died last year. The images of his work that ran with it were striking. Equally striking, though, was the consensus of pretty much everyone in the comments: This isn’t architecture at all. Seeing as only one of Woods’s designs was ever constructed, it’s not hard to see where the detractors were coming from. To Tom Ngo, however, they would be taking a woefully narrow view of the field. Ngo’s simple, charmingly illustrated buildings depart from reality in a number of ways. Some defy perspective, others overlap impossibly. They look like the type of houses M.C. Escher might like to live in (inescapably, forevermore). Granted, it can be hard to see what, exactly, Ngo is critiquing here. 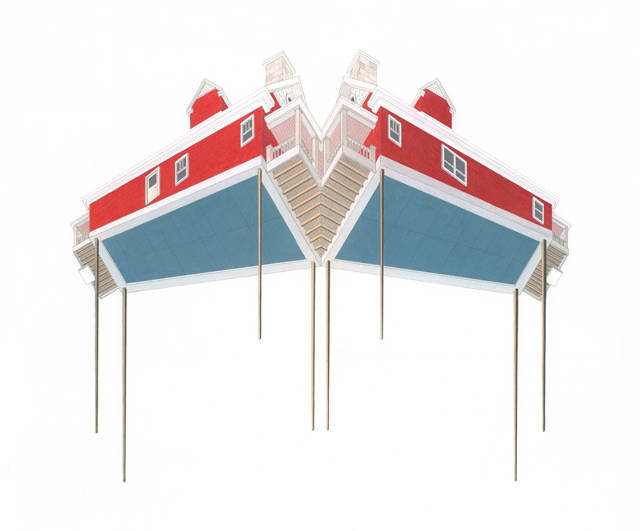 I’m not sure how much you or I can learn from a house on elongated candy cane stilts. But that doesn’t invalidate the work. It may well be the case that these types of projects are most valuable to the architects who work on them–exercises that force their creators to challenge their thinking and push their craft outside the limits of comfort or orthodoxy. Ngo says he drew inspiration from the work of John Hejduk and Daniel Libeskind–renowned architects who also, at various points in their careers, dabbled in the unbuildable. See more of Ngo’s work here.